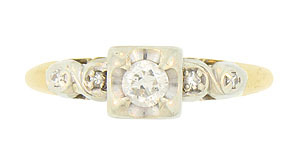 This 14K bi-color vintage engagement ring is set with a sparkling .25 carat round cut diamond. Spinning white gold mountings on the rings shoulders are set with additional fine faceted diamonds. 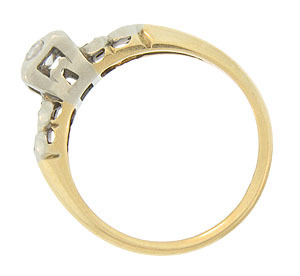 The band of the wedding ring is crafted of yellow gold. 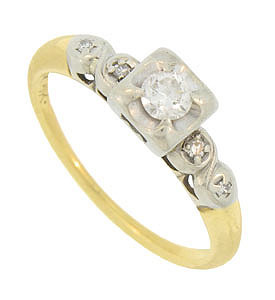 The floral inspired ring measures 5.77 mm in width. Circa: 1930. Size 7 1/2. We can re-size.